A lovely song to start the day ! Both versions were good. I’ve often wondered why singers vary so much. You see how many youngsters in the reality shows get hounded on so many minute aspects including enunciation. Nityashree’s voice sounds so young, kiLinda or tender as they call in Malayalam, whereas Bombay Jayashree’s is really majestic. I like crisp versions myself, make it easier to transcribe the song. Hello Jay! Actually I think this is from an old recording of Nithyasree so I guess she must have been very young. And yes BJ’s voice is majestic, I agree! Music transcends border so much more easily that poetry. Look at us Carnatic Music lovers – we happily listen to songs in languages we don’t speak but that doesn’t come in the way of our enjoyment! Havent the poets always told us to look for Krishna everywhere? Your quote reminds me of another gift to us from Bharathiyar. Kakkai Siraginile Nandalala talks of seeing Krishna everywhere. Not just in good experiences but even difficult ones – tIkkuL viralai vaitAl nanda lAlA, ninnai tINDum inbam tOnDrudaDA – (if I put my finger into the fire, I feel the pleasure of touching you). 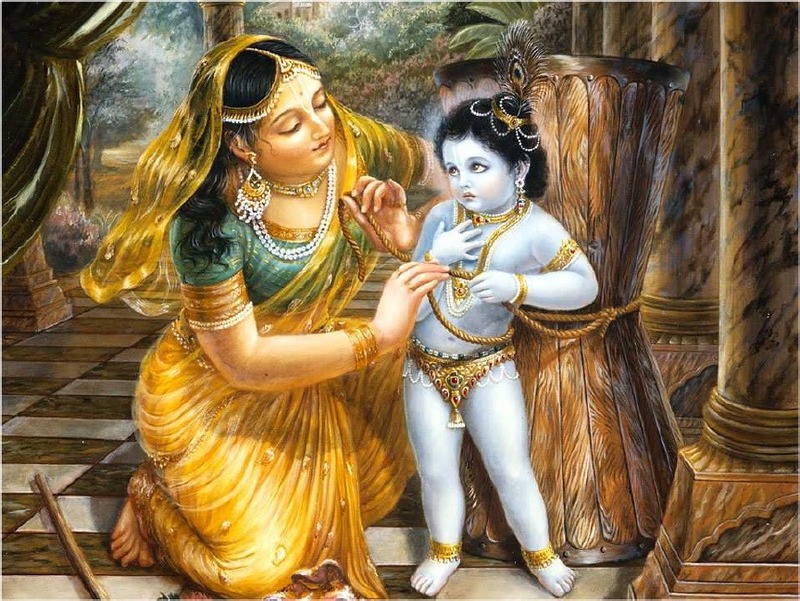 Such should be our Krishna experience as well…. Well, even I, who is a complete ignoramus in Tamil, know this song so I presume by your criteria I can call myself Tamil 🙂 A classic indeed. Bombay Jayashri’s voice, for some reason, sounds absolutely majestic live, but somewhat insipid in recordings, to my ear. Have no clue why. Listening to her live is an amazing experience, even when acoustics are bad. If she performs at the Royal Albert Hall or the Concertgebouw , it would be worth going a thousand miles to enjoy. Granted I am art challenged, but I never understood the allure of Vermeer’s Milkmaid. Let us say that the close resemblance to Rajalakshmi (my mythical proportionally challenged Indian lady) is uncomfortable close :):):) So Krishna’s song is better in your other poetic metaphors ! Lalgudi’s Mohanam – well that even transcends divinity. BJ does sound divine live, doesn’t she! However, I don’t feel insipidity in this recording even though no recording can compare to the live sound. I continue to enjoy the music pieces and descriptions. descriptions.I still do not understand a word of Tamil.I stay north of Vindhyas and geographies surely do not come in the way of the waves of sound or music.The Comments always intimidates.Cultured,refined understanding and above all great ears.Them all. I am glad you enjoyed the music in spite of the language barrier. Hello Prasad, a pleasure to see you back here! I am sorry for such a tardy reply, I am been very busy in my personal life and sadly neglecting my blog. I am extremely fond of Lalgudi’s rendition of this piece. He is sheer magic! I put him on a pedestal far above any musician I know! But still, I feel that listeners to listen extensively to vocalists, become familiar with the words and meanings before listening to Lalgudi to get a full appreciation of his skills. Just as you say, our appreciation for his interpretation of the words/phrases you highlight is because we know the song so well and understand the words. Even without that his music is beautiful, yes, but we dont get the full extent of his mastery. Thanks for your wishes and prayer, I am ever grateful. Sorry, I dont understand the context of DKP’s song? Do you mean I should have a link to DKP’s rendition? You are welcome to add links of renditions you like! My associations are a bit different 🙂 I do associate the song with dance of course..
you are missing the background music score. The ragas were chosen by Sudharsanam.